Work Flow System (WFS) is a classic example of powerful yet a very light weight client server application Cogniz develops. Work Flow System is a client server windows application developed for National Health Service (NHS) of UK. This is extremely user friendly application, developed keeping the users in mind with no or very poor computer knowledge. WFS automates the work flow across the hospitals in the UK. WFS, with multiple user groups, manages the complex data containing the information loaded by the doctors, secretaries and the transcriptionists. Administrator can create unlimited organizations, departments in the hospital; add doctors, secretaries and transcriptionists to the departments. Audio files, recorded by the doctors, are browsed into the WFS from the local or external storage and are assigned to transcriptionists who then will play the files and transcript them. Another very useful feature of WFS is the implementation of backend server behind the scene which very swiftly puts the files into the pipe, delivers on the other end (transcriptionist end), and retrieves the documents through the same pipe line. User is facilitated to outsource the files with just one click to other locations to get the work done by other transcriptionists. Once the transcription is done files are loaded back into the system. Cogniz is dedicated to deliver the highest quality products and it makes sure all the projects it follows the strict guidelines of the respective field. Cogniz now is a part of Health Level 7 (HL7) group which means the Work Flow System application a perfect fit solution that is complaint with any other application an organization might use. 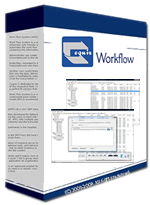 Work Flow System is a very generic application and is an optimized solution for any sized organization. It is like a customized place holder of your business logic, all you need is to specify your business requirements and Cogniz will mould WFS to accommodate your requirements in no time.